For decades, we've lived in a world full of #basic barbies. Pink convertible, itty bitty waist, chiseled cheekbones and blonde hair. Are blondes really more fun? Jury's still out, but one thing's for sure...basic barbie is hard to relate with (unless you know a good plastic surgeon and have access to the best bleach your hairdresser can buy). While there's still much progress to be made, we've come pretty far when you break things down in Barbie world. The icon has diversified as of late. We've got a voluptious and curvy barbie modeled after Ashley Graham Barbie. The athletic Misty Copeland Barbie. The gorgeous and black Ava DuVernay Barbie. And now, Barbie is finally donning a hijab, inspired by American fencer and Olympic bronze medalist, Ibtihaj Muhammad. When Mattel told Ibtihaj that they were planning to create a Barbie in her honor, she cried. And after that, she made sure a few things happen. She waned to make sure that Barbie wear dark eyeliner, have big, strong legs and that she proudly wear a hijab. "It’s something I wear like I wear a shirt or I wear pants," Ibitihaj continues to say she hopes children will "take it off and try it on their other Barbies." The first prototype wore a padded fencing outfit with a removable helmet that revealed her hijab. Ibtihaj asked for the fabric to be made thicker so that it was opaque. 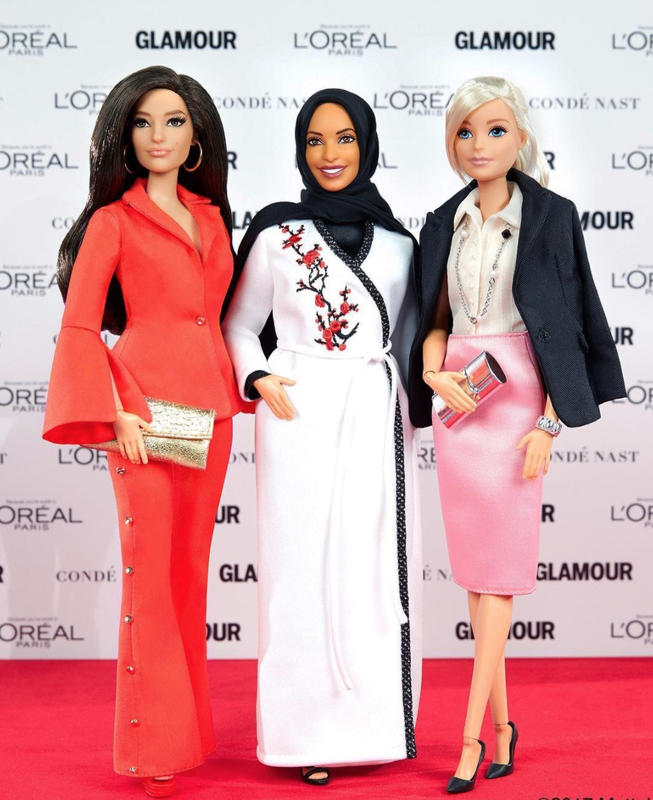 The Ibtihaj Barbie is part of Barbie’s Shero collection that's designed to encourage children to be anything they want to be.